Everything's coming up daisies - the flower of spring! 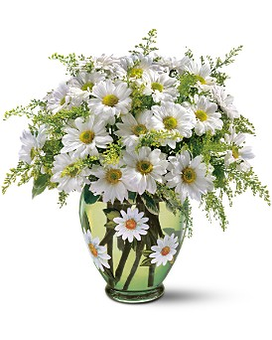 This exuberant arrangement features a big bunch of white daisies, nestled in a matching green glass vase that's decorated with hand-painted daisies. White daisy spray chrysanthemums and solidago, accented with variegated pitta negra, arrive in Teleflora’s Crazy for Daisies vase.